swinging era with "THE HISTORY OF THE SIXTIES SHOW". DOZY BEAKY MICK AND TICH. A Band who were known for there very colourful stage Gear and inventive style was a Band called Dave Dee Dozy Beaky Mick & Tich. They scored a number one hit in the UK Singles Chart in 1968 with "The Legend of Xanadu". The combined sales figures were in excess of one million copies.Their other top 10 UK hits included "Hideaway", "Hold Tight! ", "Bend It! ", "Save Me! ", "Touch Me, Touch Me", "Okay! ", "Zabadak!" and "Last Night in Soho". The Casuals were a four piece British pop group in the 1960's and early 70's, best known for their hit "Jesamine" which reached No.2 in the UK in 1968.The New Casuals are a result of member changes over the years but the legend continues with the band performing Casuals hits plus a selection of great songs from the sixties. A superb 5 piece show band. Vinny is a versatile singer who hales from Leicester in the East Midlands. 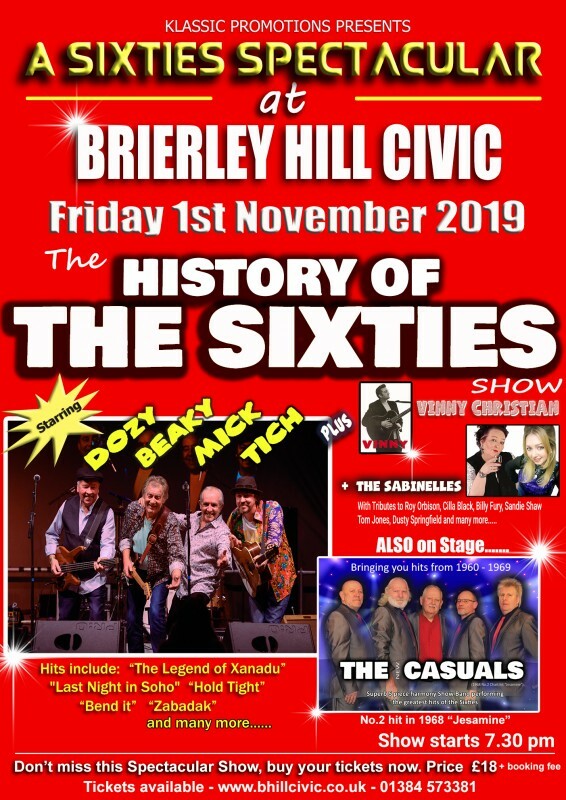 He has spent the last thirty years performing hits from the likes of Roy Orbison, The Beatles, The Searchers and many more sixties favourites. This talented Guitarist/Vocalist never fails to please, having worked Cruise Ships, Theatres and Venues across the UK and Europe. This girl duo lovingly re-create that sixties sound made famous by the likes of Dusty Springfield, Cilla Black, Sandy Shaw and many many more hits that made female vocalists so popular in the 60's decade. Two girls with very special voices that will bring back all the memories of hits like "You're my World"," I only wanna be with you" and so many other great songs. The "HISTORY OF THE SIXTIES SHOW " is not to be missed. Ticket sales are expected to be high so make sure you buy yours early !